Daniel Bedinger Lucas (130) was one of the most distinguished lawyers, jurists and litterateurs that this State has produced. He was born at "Rion Hall" in Charlestown, Jefferson County, Virginia, March 16, 1836, and was known as "the poet of the Shenandoah Valley.” He was the son of William Lucas and Virginia Ann Bedinger (43), daughter of Daniel Bedinger ( 7). He possessed a poetic temperament, and was an orator of power and force. He was the valedictorian of his graduating class of the University of Virginia. 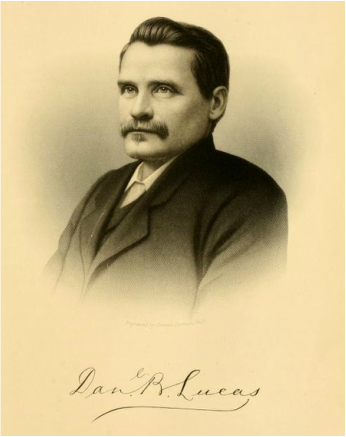 He then entered the well known law school of Judge John W. Brockenbrough, at Lexington, Virginia, and after his graduation in 1859, he began the practice of law in Charles Town and moved the next year to Richmond. At the beginning of the Civil War, he promptly offered his services to the Confederacy, and became a member of the staff of General Henry A. Wise and took part in the Kanawha Valley campaign, but his physical disability from a childhood spine injury kept him from active service in the last years of the war. Shortly before the close of the war, came one of the most thrilling as well as one of the most tragic experiences of his life, when he, amid great difficulty and danger, ran the blockade to New York in a vain effort to save the life of his college friend, John Yates Beall, who had been captured and was to be tried as a spy. Lucas was prevented by Federal officials from attending the trial and defending his friend in court. Beall was pronounced guilty and was executed on Governor's Island, February 24, 1865. Being unable to return to the South, Mr. Lucas went to Canada, where he remained until the close of the war. It was here that he wrote and first published his famous poem, "The Land Where We Were Dreaming". When Mr. Lucas returned to his home shortly after the close of the war, he found himself no longer a resident of Virginia, but of West Virginia and because of the requirements of the Test Oath he was barred from the practice of law until 1871. During 1869-70, he was co-editor with J. Fairfax McLaughlen, LL. D., of The Southern Metropolis, a weekly published in Baltimore. He took a prominent role in the Democratic Party politics of West Virginia, acting as Democratic elector in 1884 and 1886. Judge Lucas attained great distinction in his profession, because of his wonderful grasp of intricate legal questions and his eloquent and convincing oratory. On account of his extensive law practice, he declined to accept a position as professor of law in West Virginia University, and also an appointment as circuit judge in his district. Among the honors that came to him were his election to the State Legislature, and his appointment in 1889 as judge of the Supreme Court of Appeals of West Virginia, of which he was president at the time of his death in 1893. He always took a high position on, and maintained a strong adherence to, the Democracy of the fathers of that party, against the alleged departure from the faith and doctrines of Jefferson, Madison and Monroe. He was instrumental in the defeat of the Hon. Johnson N. Camden, the Democratic nominee, for a seat in the United States Senate in 1887, whom he considered an ally of Standard Oil. Because of that alleged departure, The Legislature failed to elect a Senator, and after its adjournment Governor Wilson appointed Mr. Lucas to that position during the interim. But a special session of the Legislature was held the following April and Judge C. J. Faulkner was elected to the existing vacancy. In spite of his busy life as a lawyer and judge, he found time to devote to literary work. Shortly after the publication of "The Land Where We Were Dreaming." he published a "Memoir of John Yates Beall." In 1869, he published "The Wreath of Eglantine," which contained the poems of his gifted sister, Virginia, and a number of his own poems, among which was his long poem "St. Agnes of Guienne." which was favorably received throughout the South. In 1869, Mrs. Margaret J. Preston writes: "Whether 'St. Agnes of Guienne' is an old legend, as we suppose or an invention of the poet, its handling is original and striking. The style has a well chosen quaintness in fine keeping with the medieval period in which the story has place. There is sometimes a rich sensuousness of description which suggests Keats' "Eve of St. Agnes", "...Very delicate, cameo-like chiseling, betraying, we think, the mallet hand ... ." As critics, we might pour out a vial or two of wrath on the head of some of Mr. Lucas' riotous metaphors, but we forbear, mollified and subdued by the abounding beauties of the poem ... ."
Of the volume, "The Wreath of Eglantine," a critic writes in The New Orleans Commercial Bulletin, of January 18, 1869: "These graceful poems possess so much of real merit and are marked by so many evidences of positive poetic beauty, that they might be left to introduce themselves... . Mr. Lucas is not unknown in the periodical literature of the day, and there are many, both North and South, who will recognize in the pages of this volume old and highly prized favorites. . . . Among them will be particularly remembered "The Land Where We Were Dreaming"... . These are followed by some twenty 'Tintographic Melodies' some of which even a stern critic might declare to be almost faultless in conception, and melody, and rhythm, etc." Among his most charming poems are a number of love lyrics addressed to Miss Lena T. Brooke of Richmond, Virginia, who became his wife in 1869. "The Wreath of Eglantine" was followed by a war drama, "The Maid of Northumberland," in 1879 and by "Ballads and Madrigals," in 1884, in which are found a number of occasional poems of merit. He contributed a number of notable papers to The Southern Metropolis. Among them were his orations on Jackson, John Randolph, Henry Clay, and Daniel O'Connell, all of which received high commendation. Since the death of Judge Lucas, in 1909, a collection of his poems entitled "The Land Where We Were Dreaming" and a volume of his dramatic works including "The Maid of Northumberland," "Hildebrand," and "Kate McDonald" have been edited by his daughter, Virginia, and, Professor Charles W. Kent. In the introduction to Judge Lucas' "Dramatic Works," Doctor Tucker Brooke of Yale University says: "Though Judge Lucas's most permanent contribution as a poet will doubtless be found, where he himself would have indicated it, in his lyrics of patriotism and sentiment, the poetic distinction of his plays is quite indisputable. The use of blank verse is never with him, as it has so often been with closet dramatists, a mere presumptuous affectation or a garish cloak to cover the writer's incapacity for realistic dialogue." My heart, my heart is in the Mountains! And gather the dew in fountains! And a crag in the sunset's glow! King of the Hills! Blue Ridge that I love! In the land where we were dreaming! O'er the land where we were dreaming! For the land where we were dreaming! From the land where we were dreaming! While we have slept, our noble sons have died! And are they really dead, our martyred slain? In peace, in war, the battle's just begun! Two of Daniel Bedinger Lucas' poems have been set to music by Terry Tucker. One of the poems, "My Heart is in the Mountains" is given above. The other poem, "Celestial Spell" is given below. Recordings of the musical compositions can be accessed at Terry Tucker's website. of the poem by Daniel Bedinger Lucas. Set to Music by Terry Tucker. The very soul of music fell? Thy physique but a supplement. Before the altars of our hearts. A far diviner gift than Thought.